Often just for fun many people around the world decide to try to contact the dead. Some use Ouija boards, some even today try ghost hunting. But over the past generations Séance's have always been the number one method for calling up the dead to question. A séance was in the past a gathering of individuals at which a medium attempted to receive communications from the spirits of the dead. Many paranormal experts often equate today's standard ghost hunting techniques as modern type of séance. Also the collection of EVP's or most of the technical equipment of today seems to replace the drum, horn, bell or candles of past generations. Now a days to "Conduct A Séance." many bring everything they can to document the experience. Cassadaga Spiritualist Camp is a 116 year old community of spiritually-minded people located in Central Florida. Is a town where real Séance. 's or held night and day. It is considered the most haunted hotspot in the world where the dead speak to the living. The Southern Cassadaga Spiritualist Camp Historic District (also known as the town of Cassadaga) is a U.S. historic district (designated as such on March 14, 1991) located in Cassadaga, Florida. The district is bounded by Cassadaga Road and Marion, Stevens, Lake and Chauncey Streets. It contains 65 historic buildings and 2 objects. Cassadaga (an Seneca Indian word meaning "Water beneath the rocks") is a small unincorporated community located in Volusia County, Florida, just north of Deltona. It is especially known for having a large number of psychics, also known as Mediums, and has consequently been named the "Psychic Capital of the World"
Colby claimed to work with several spirit guides who would channel knowledge to him. Colby claimed that one of his spirit guides was an Indian named Seneca, who had manifested to Colby during a séance. in Lake Mills, Iowa. According to Colby, Seneca had instructed him to travel to the south, into Florida, where he eventually arrived at a place called the Blue Springs Landing, near Orange City, Florida. According to Colby, the area that Seneca had led him to was the same area that Colby had seen during the séance. in Iowa. The Devil's Chair in Cassadaga, Florida is a graveside bench in the cemetery that borders Cassadaga and Lake Helen. According to one local legend, an unopened can of beer left on the chair will be empty by morning. In some accounts, the can is opened, and in others, the beer is simply gone, through the unopened top. The Devil is sometimes said to appear to anyone so bold as to sit in the chair. It is also noted that if the person you seek to contact in a ritual or séance. does not come forward to you in a séance. it is because their soul is suffering in hell. To go to the Devil's bench and ask the devil to allow them to communicate with you is often the case an offering of beer, a pack of menthol cigarettes and a shot of vodka or whisky is left. The next day it is believed if you go back and the item is gone then you will be able to contact that deceased person right away. The term séance is used in several ways, and can refer any of four different activities, each with its own social norms and conventions, its own favored tools, and its own range of expected outcomes. 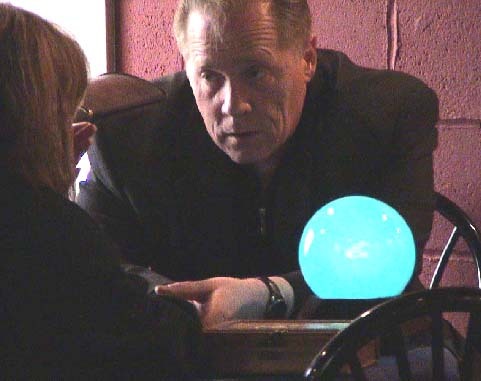 Religious séances, Stage mediumship séances, Leader-assisted séances and Informal social séances. Religious séances In the religion of Spiritualism, it is generally a part of services to communicate with the dead. The term "séance" is not often used to describe this, except by outsiders; a preferred term is "receiving messages." In these sessions, which generally take place in well lit Spiritualist churches or outdoors at Spiritualist camps (such as Lily Dale in upstate New York or Camp Cassadaga in Florida), an ordained minister or gifted contact medium will relate messages from the dead to the living. Generally Spiritualist "message services" or "demonstrations of the continuity of life" are open to the public. Sometimes the medium stands to receive messages and only the sitter is seated; in some churches, the message service is preceded by a "healing service" involving some form of faith healing. In addition to communicating with the spirits of people who have a personal relationship to congregants, some Spiritual Churches also deal with spirits who may have a specific relationship to the medium or a historic relationship to the body of the church. An example of the latter is the spirit of Black Hawk, a Native American warrior of the Fox tribe who lived during the 19th century. Black Hawk was a spirit who was often contacted by the Spiritualist medium Leafy Anderson and he remains the central focus of special services in the African American Spiritual Churches that she founded. In the Latin American religion of Espiritismo, which somewhat resembles Spiritualism, séance sessions in which congregants communicate with spirits are called misas (literally "masses"). The spirits contacted in Espiritismo are often those of ancestors or Catholic saints. Automatic writing or psychography is writing which the writer states to be produced from a subconscious and/or spiritual source without conscious awareness of the content. In spiritism, spirits are claimed to take control of the hand of a medium to write messages, letters, and even entire books. Automatic writing can happen in a trance or waking state. One of the first mentions of the automatic writing method used in the Ouija board is found in China around 1100 BCE, in historical documents of the Song Dynasty. The method was known as fuji 扶乩 "planchette writing". The use of planchette writing as a means of ostensibly contacting the dead and the spirit-world continued, and, albeit under special rituals and supervisions, was a central practice of the Quanzhen School, until it was forbidden by the Qing Dynasty. Several entire scriptures of the Daozang are supposedly works of automatic planchette writing. Similar methods of mediumistic spirit writing have been widely practiced in Ancient India, Greece, Rome and medieval Europe. Spirit boards, also known as talking boards, or Ouija boards (after a well known brand name) are flat tablets, typically made of wood, Masonite, chipboard, or plastic. On the board are a number of symbols, pictures, letters, numbers and/or words. The board is accompanied by a planchette (French for "little table"), which can take the form of a pointer on three legs or magnifying glass on legs; home made boards may employ a shot glass as a planchette. A most basic Ouija board would contain simply the alphabet of whatever country the board is being used in, although it is not uncommon for whole words to be added.